Maxx adores his people so much that he wants to be with them all the time. In Dogtown, he lives in a kitchen so he can be as close as possible to his caregivers.Born in 2009, Maxx suffers from separation anxiety and gets nervous during storms. When he is afraid, he has a tendency to try to run away, so he'll need a secure enclosure. 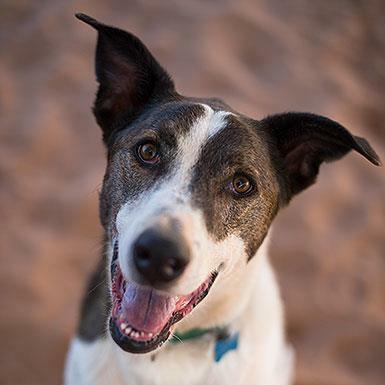 He can be pretty picky with his doggie friends, and it's best for him to steer clear of small dogs and cats. Maxx is currently a staff-only dog at the Sanctuary because of an isolated bite incident in the past. He has not shown any aggression before or since. He is looking for an understanding person who is willing to spend lots of time with him and help him feel safe. 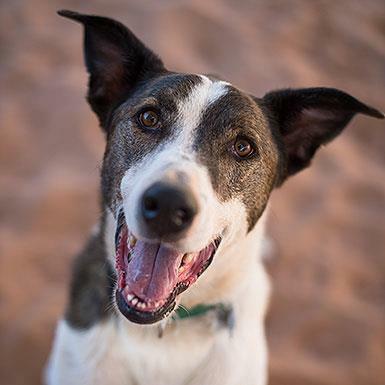 If you'd like to be there for Maxx, he would love to meet you. 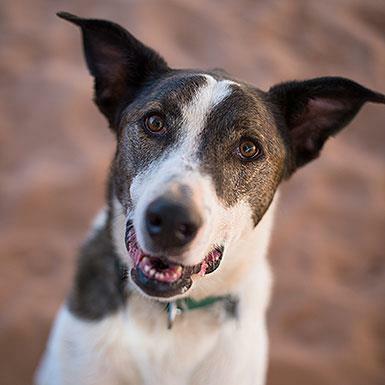 These animals require that the potential adopter come and meet them at our Sanctuary in Kanab, UT. This animal is available for an overnight outing. If you are staying in a hotel, check in advance to make sure they allow dogs or cats. There is a pending adoption application for this animal. Sometimes adoptions often fall through so please keep checking. Based on observations from volunteers, fosters, previous owners and staff, this animal may do best in a household without dogs. Based on observations from volunteers, fosters, previous owners and staff, this animal may do best in a household without cats and other small pets. This animal has a special medical, physical, or behavioral need. Many times these are minor so please fill out the adoption survey and the adoption specialists will contact you with more information about any animals you are interested in. This cat has tested positive for FIV. FIV-positive cats can live normal lives both in quality and duration. They are great pets! There is a misconception that cats with FIV cannot live with other cats. That’s simply not true. Learn the risks here. This cat has tested positive for feline leukemia, or FeLV. FeLV-positive cats can live perfectly happy lives, and they deserve to do so. People who have FeLV-positive cats just need to be aware that they may have a shorter life span and that they need to be taken to a veterinarian as soon as a problem is noted. Read more here. This cat has been declawed by previous owners.